There is a 48 hr cancellation policy. If no notice is given prior to 48hrs of expected arrival then full fare will be charged. After made a booking, We will charge the remaining balance through your credit card. Minutes outside of Yosemite National Park, The Yosemite International Hostel has something for everyone and is always light on the wallet. You can rest assured you'll love your stay at our awesome hostel. Book Now because rooms fill up fast! We also have free wifi, laundry services, common rooms, an accompanied bistro with the town's longest happy hour, in hostel kitchen facilities. This property has a 2 day cancellation policy. Failure to cancel within this time will result in a cancellation charge equal to the whole reserved night of your stay. - Check In: 3.00 - 10.00 pm (In the event you need to arrive after 10 PM, please let us know. There will be a late check-in fee $15). - You would not be checking in after midnight. * Cards are only accepted when booking on the website to confirm the booking and are not a valid method of payment for our hostel outside of the booking confirmation process. - Breakfast is not included. - Taxes is not included. It was a warm place to stay! The staff was kind and friendly. We (my teenage son and I) loved the hostel in this tiny town on our way back form Yosemite Park. It was like a perfect house in the prairie. Host was very attentive and despite the house being old, we were very comfortable. Thank you. Everything was good. But the bed gotta go with the wooden bottom. So annoyed with the loud sound Everytime I move or someone else moves.But overall. I'll stay again. Thanks for the hospitality. a clean room, friendly staff made the stay enjoyable. 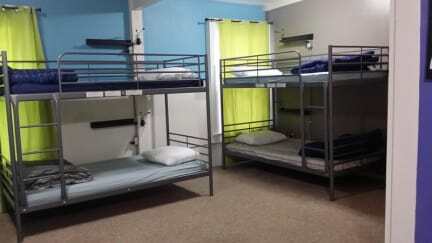 To the staff of the Yosemite International Hostel: If guests are checking in during the night: PLEASE do a more quiet check in, so other guests in the room next door can sleep !! Great place, very convenient location and large room. Though there was a heater, we were VERY cold. The hostel would be even nice with a small couch/lounge area. Nice hostel if you wanna visit Yosemite! We stayed 1 night in late October. The place was comfortable and given the cold weather supplied heaters in the room who h was nice. The location was great for visiting Yosemite. The kitchen was fairly crowded in the morning due to the size but other than that the hostel was ideal. Gets the job done! Clean and quiet, about an hour out from the actual park. Old furniture, terrible beds.. restroom with short ceilings...mattress uncomfortable and linen with stains. Good location. Friendly chinese receptionist. Water in the shower imposible to control the temperature. Not recomended ive been in several hostel in the middle of nowhere in East Europe, all of them much more decent.